This presentation, titled “Changing Course to Preserve America’s Roads”, consists of 21 slides in either .pdf or .ppt format. The presentation starts with predictions of 2020 traffic and funding requirements, and documents the System’s deterioration, describing this as a threat to National Security. It then points out the “worst first” fallacy, suggests and defends preservation as the only viable alternative, and states the Campaign’s key objectives. The presentation concludes with a call for grassroots action and an invitation to join the Coalition to Preserve America’s Roads. This is a 23-page illustrated document to help campaign leaders maximize opportunities to educate the media and gain visibility for the Pavement Preservation approach. Topics covered include understanding today’s media and what they want, delivering the Pavement Preservation message, handling interviews, and tracking media coverage. The Media Fact Sheet consists of a page of talking points that can be used in conversations with the media. The points cover the long-term relative costs of preventive maintenance compared with the traditional policy of “worst first”. 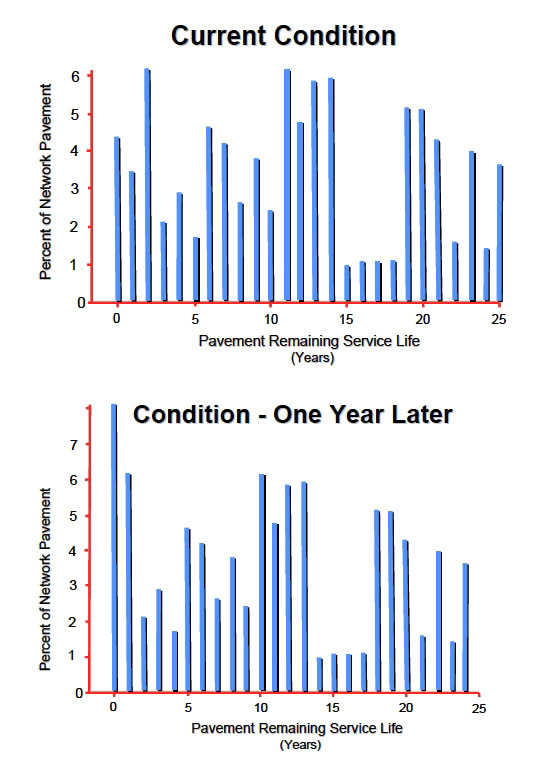 This exhibit illustrates how a histogram portraying a road network’s distribution of remaining service life (RSL) changes after a year without any life-extending remedial treatment.